Enjoy contemporary cuisine in a grand dining space within an elegant heritage building. 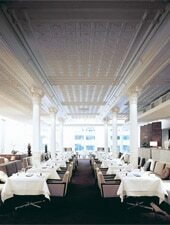 : With its soaring columns and molded ceiling, sparkling chandeliers and ranks of double-clothed, formally set tables and banquettes, here is a choice place for any occasion, from sealing a major deal to a proposal. Or then again, it can simply be a special treat for someone who appreciates fine food and wine. Chef Peter Doyle’s contribution to Australian dining over the past thirty-plus years is unique and wide-ranging. At est., in the precincts of the gracious Establishment Hotel, he has found the ideal stage on which to present his cuisine. And while all this grandeur could make some diners unsure, the friendly staff quickly put guests at ease with their relaxed yet professional service. Lunch (two to four courses with a tasting menu on request) can be swift and light (spring asparagus and grapefruit, followed by steamed Murray cod and shaved abalone, for example) or as lengthy as you want. Dinner expands to a set seven-course tasting menu. Otherwise a two-, three- or four-course chef’s menu will appeal. Expect to see seasonal dishes such as slow-cooked pork jowl, parsnip and beurre Bosc pear with hazelnut and sherry vinegar, or duck foie gras with quince and cavolo nero. Desserts take the experience to another level with chocolate delice, blueberry sorbet and banana caramel. Diners may order the menu with matched wines or choose their own from the wine list, one of Sydney’s best, on which Champagne stars. For small groups, there is an intimate private dining room available for up to 16 people.